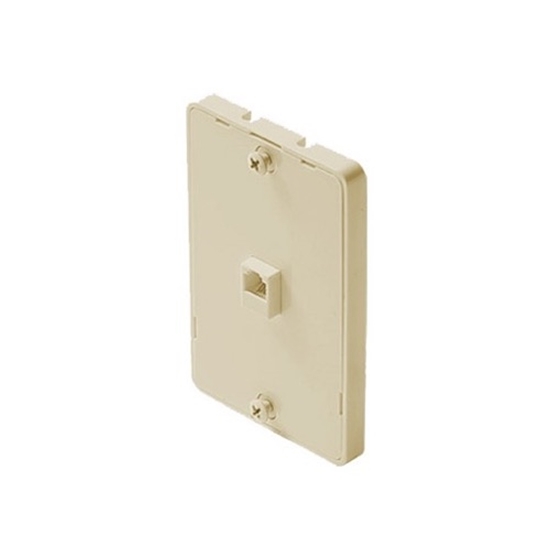 Flush mount jack and cover for wall phones. Fits all standard modular phones. Replaces or adds a flush mount, modular wall phone jack. Pull line cord through to front of terminal plate. Fasten jack to wall box through diagonal openings in jack, using long screws provided, or hollow wall fasteners. Remove 2" of outer jacket from line cord, exposing colored wire leads. Connect colored wire leads to terminals matching by color. Secure clear insulation film around modular jack. Replace cover plate. Mount phone on mounting screws.